Sai Datta Peetham is a non-profit organization and established as a centre for prayers, worship, celebrating and sharing Sai Sadguru's message and invoking his blessings for the betterment of human lives, materially and spiritually. Sai Datta Peetham, is a tax-exempt organization under Section 501(c)(3) of the Internal Revenue Code. All donations made in USA are tax deductible. Sai Datta Peetham has strong desire to support and promote philosophy of Shirdi Sai Baba and is mainly dependent on the donations by devotees. We have expansion plans to improve our facilities and enhance the experiences of our devotees when they visit the Sai Datta Peetham. 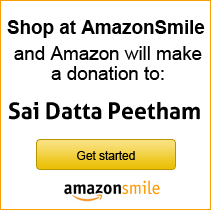 You can willingly donate to Sri Sai Datta Peetham for various activities. To Donate for Flowers, Annadanam, Temple construction and General donations.